Not being a huge fan of this genre of ‘dying’ teen movies, it would be so easy to sum up this film with just the title alone and leave it at that. 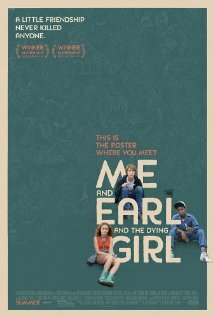 It would also be easy to criticize the fact that Me & Earl & the Dying Girl is directly aimed to the young teen Fault in Our Stars crowd with whom it’s guaranteed to be a summer box office moneymaker. And while all of that is true, what people will be missing if they don’t go to see this film is a truly good, touching, funny, quirky and well acted film. I went in to this film wanting to dislike it for so many reasons, the sheer fact of its utter teen-dream marketability and knowing how it will end thanks to the title. And to my pleasant surprise, while watching, I felt my mind change, change and then change again. I was reminded that movies like this do exist and some times they can not only be really good, but they also can be commercially successful at the same time and that’s a-okay for me. 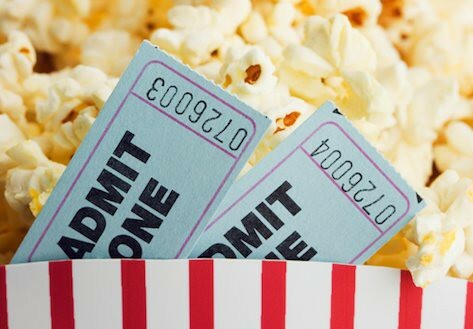 The film chronicles the senior year of “Greg” (Thomas Mann), his best friend/co-worker “Earl” (RJ Cyler), and “Rachel” (Olivia Cooke), who at the behest of his mother (Connie Britton) has been told to go ‘be friends with her’ as she has been diagnosed with leukemia (aka get it..Me & Earl & the Dying Girl). Rachel of course, sees right through his initial ‘pity’ visit but slowly and surely Greg begins to win her over with his cheekiness and charm. And yes, all of the teen dramedy tropes are present and accounted for. The awkward parents, most especially Rachel’s mom “Denise” (Molly Shannon) who practically mauls Greg she is so happy he is there for her daughter, the role of tatted up cool teacher who ‘gets it’“Mr. Walker” (Jon Berenthal) whom while he goes into some original territory – though maybe a little to much for me as I think there might be a line or two that is crossed. Add in the exploration of high school cliques as Greg seems to be the master of his universe as he somehow cultivates relationships in each clique in his school. He glides from circle to circle seemly effortlessly, not alienating anybody or anyone which if I remember high school as I do, is pretty near the impossible to make happen. Though with all this accomplishment, he doesn’t want to call anyone his ‘friend’ as he doesn’t want to emotionally connect with them fully, so he calls Earl, his actual best friend, a co-worker. The two share a bizarre, but fun love of cinema and re-create about 40 spoofs of films such as A Clockwork Orange & The Seventh Seal among others. These are some of the high points of the movie as it’s rather hysterical to see these kids become so creative over the years doing these oh-so-bad-they-are-good mini movies. A good supporting cast keeps the film fresh and rolling along. Greg’s eccentric parents (Connie Britton and Nick Offerman) add a fun jolt of parental weirdness to their scenes, While I found myself wanting a bit more in regards to Rachel’s character, the film’s treatment of her friendship with Greg is both darkly funny and realistically somber. This is one movie that it’s safe to see regardless of its given ending. REVIEW: “MAD MAX:FURY ROAD” (2015) Warner Bros. Yes, I know it’s all about Jurassic this weekend..but hey if that’s sold out – go see this wonderful indie.. it’s truly a lovely film!